We’ve been moving very slowly at the deluxe shed lately. It’s all wired and mostly insulated. We are just finishing up the crappiest of the insulation now. Where the stairwell comes up to the second floor, there is, of course, a large opening. We built a wall on one side to protect the opening (rather than a banister), but haven’t gotten around to the wall on the other side. 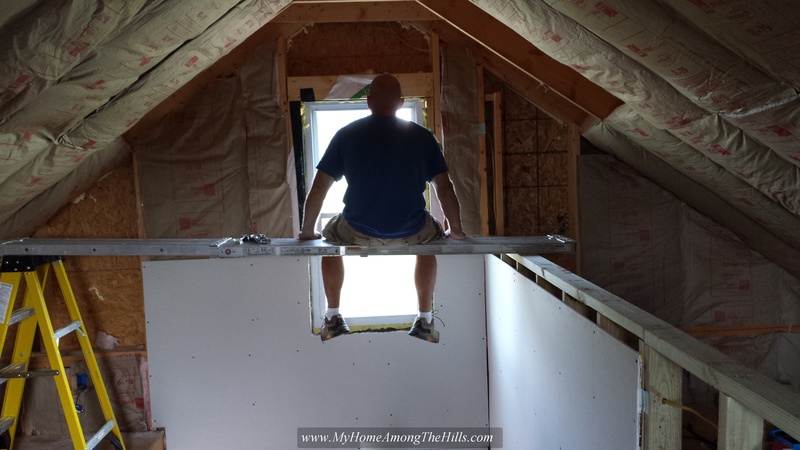 Still, I needed to get the ceiling insulated so I was left with a problem…how to insulate the space over the stairwell. Luckily, I am foolish! We have on loan a “board” made out of aluminum that is meant to be used on ladder jacks. It is designed to be placed on stands of some sort so one can work over spaces just such as the one I have! Only one problem remains…I only have one wall so I couldn’t lay the board across the gap evenly. Much to Emily’s dismay, I just put a step ladder on the other side. The ladder has absolutely no extra width so we had to perch the board carefully. Emily held it as I bounced around on the board and we got the insulation done! We still have to finish the drywall and a few finishing touches in that area but I should have the second wall built when that time comes around. In the meanwhile, I will just hang around and get things done as best as I can! So basically there is nothing between you and a nasty fall except air and opportunity. Been there…done that…..not a good idea….but needs to be done. Stay safe my friend. Josh took some of those risks when building our barn in Georgia. I know just how Emily feels! Stay safe and I can’t wait to see the finished product posted on here. Butch has been known to pull stunts like that. You be careful, you hear??!! Are you booking the online reservations yet, or is it just gonna be first-come-first-serve? We’re a little Barnum and Bailey, a little Hard Rock Cafe…Come one, come all..love all, serve all! That looks like a fairly new and sturdy step ladder. I would have made sure to use an old rickety wood one for doing the same thing just to spice things up a bit!